Ingredients, how it's made, and best storage practices. Ice cream is a mixture of milk, cream, sugar, and sometimes other ingredients, that has been frozen into a soft, creamy delight using special techniques. Ice cream has been a popular treat for hundreds of years but only become commonplace since the widespread use of refrigeration. The exploding popularity of ice cream has led to a number of ice cream variations including frozen custard, frozen yogurt, and even non-dairy versions made with ingredients like coconut milk. In the United States, ice cream must contain 10-16% milk fat. Higher milk fat ice creams generally have a smoother texture because they contain a lower amount of water and therefore fewer ice crystals. Ice creams that contain less than 10% milk fat are referred to as "ice milk" or more popularly, "low fat" ice cream. In addition to milk or cream, ice cream often contains stabilizers, like gluten, to help keep the mixture a consistent texture. Sugar or sugar substitutes are usually added to provide the sweet flavor that most people expect. No sugar added varieties of ice cream have become popular and rely on the addition of fruit and the natural milk sugars for their subtle sweetness. 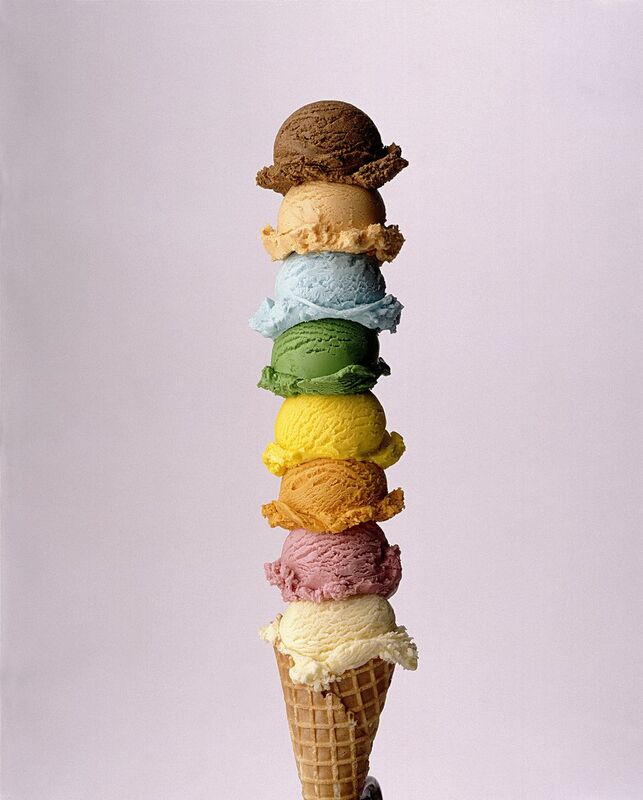 The variety of flavors and additives in ice cream has kept its popularity strong with consumers. From exotic fruits like mango and pomegranate to unconventional flavors like coffee or basil, thousands of ice cream flavors, both savory and sweet, have been created over the years. If you place a container of milk or cream in the freezer, you'll end up with a stiff block of frozen liquid, not the soft, creamy ice cream that we're used to. Special techniques are employed to make ice cream that creates smaller ice crystals and incorporates air, which produces a soft texture. Constantly churning ice cream, whether by hand or mechanically, ensures that large, stiff ice crystals do not form within the mixture. The churning process also serves to introduce air and create a foam-like texture, further softening the mixture. Salt, which lowers the melting point of ice, is often used in the ice cream making process. When the melting point of ice is lowered, it draws heat out from the ice cream mixture faster, causing it to freeze at a quicker rate. Freezing the mixture quickly produces smaller ice crystals and a softer final product. The salt that is mixed with the ice never comes in contact with the ice cream and therefore does not affect the sodium content. The salt filled ice is packed around an inner ice cream chamber that keeps the ice cream in and salt out. Liquid nitrogen and dry ice can also be used to make ice cream as they also produce a quick freezing action. The popular mall treat, Dippin Dots, is small balls of ice cream that is created using liquid nitrogen to freeze small droplets of ice cream. Ice cream should be kept as cold as possible during its transport from the store to home. The process of melting and refreezing can create large ice crystals and reduce it's smooth texture, making it not only hard to scoop but less than delightful on the tongue. Store ice cream in the main compartment of your freezer, rather than the door, to make sure it stays well below its freezing point. Items in the freezer door are repeatedly exposed to warmer air when the door is opened, which can cause a thaw and refreeze cycle and lower the texture quality of the ice cream. To prevent ice crystals and rogue flavors from absorbing into your ice cream after opening, simply press a piece of plastic wrap onto the surface of the ice cream and then replace the lid. This will provide a barrier from air and moisture while it is stored in the freezer. For the best flavor and texture, consume ice cream within a month of purchase.